Three. Two. One. Done! 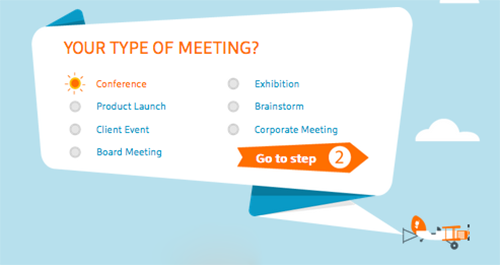 That’s how easy it should be to get started on your meeting design. Because let’s face the facts: as a meeting or event planner time is a luxury that is not part of the budget. In reality, finding the perfect location and supplier for your business event can be a time consuming endeavour though. Since the Dutch are known for their innovative solutions and creative thinking we turned this challenge into a solution. Let me introduce you to the Holland Site Selector. The Holland Site Selector is an easy-to-use tool that will only take 5 minutes of your time. And you can trust me on this as I have tried it myself many times! But it is so much more than a tool: it will inspire and help you design the business event of your dreams. Select the type of meeting you are organising. Is it a conference, exhibition, product launch, brainstorm, client event, corporate event or board meeting? 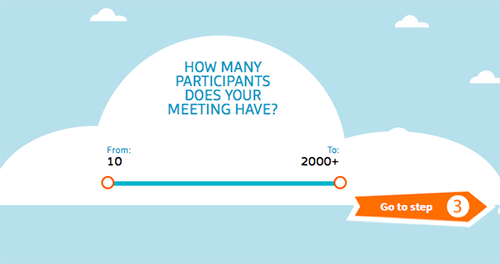 Tell us how many delegates you are expecting to attend your event. Not sure yet? Just use the sliders to give an indication. Anywhere from 10 to 2000+ delegates works for us! Step 3 – What Atmosphere Are you looking for? Atmosphere plays a big part in meeting design and can actually make or break an event. Are you looking for a modern, historical, classic or design atmosphere? Holland offers it all, you just have to choose. In addition you can also select which types of suppliers you are looking for. By default we selected all, but maybe you are only looking for a special venue and a hotel. In that case simply uncheck the other boxes. Tip: if you are not sure yet which atmosphere would benefit your event most or if you would like to provide your client with a number of choices you can fill in the tool more than once and just select different options here. Now all we need to know is where we can send your personal meeting advice to. Just fill in the basic details and hit the ‘Send PDF’ button. Et voila, within a couple of minutes you will get your personal meeting advice delivered directly to your inbox. It is basically a ready-to-go shortlist document that you can show to your client for a first impression. And it is print-friendly! Tip: Most of our partners are attending one of the major MICE events around the world as part of our Team Holland. If you are attending any of these events as well why not arrange a meet & greet with the suppliers from your personal meeting advice? It’s a convenient and great way to put the final touches to your meeting design and see which suppliers are the best match for your event. As we get closer to the exhibitions you can find an overview which Dutch suppliers will be present at the Holland stand right here: IMEX Frankfurt, The Meetings Show UK in London, IMEX America in Las Vegas and IBTM World in Barcelona. So what are you waiting for? Your meeting design inspiration is just 4 easy steps away. Let’s get started!